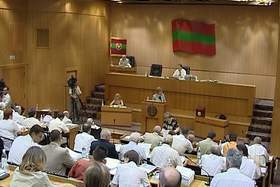 Transdniestria's opposition-controlled legislature is increasingly facing off against President Igor Smirnov by refusing to pass laws initiated by the executive. In a surprise victory in December 2005, the opposition won a majority in Parliament. The latest standoff took place this week when Parliament rejected changes to the unrecognized country's tax laws. The cabinet of ministers under Pridnestrovie's President Igor Smirnov is facing increasing political resistance from the country's opposition-led Parliament. Over the past month, the 43-member Supreme Council has consistently refused to support the President's legislative initiatives. Since a surprise victory in December 2005, Parliament has been dominated by opposition party Renewal, led by 39 year old Yevgeny Shevchuk, with Smirnov supporters such as the Respublika party now in the minority. On Monday, a Parliamentary committee rejected amendments which Smirnov's cabinet had proposed to the tax system. The executive wanted to give tax authorities the ability to perform unannounced spot checks of the books of local companies "to better define their incomes," a move which the pro-business Parliament vehemently rejected. As reported by news agency Infotag, MP Anton Onufrienko argued that "our companies have already suffered too much from Moldova's economic blockade and increased taxation. Now, if we permit the tax inspectors and individual tax agents to become an extra headache to our working businesses, this will bring nothing but nervousness and will only undermine their normal operation, the more so that our tax service has already been equipped with the authority to make sudden checks in response to anonymous letters with complaints coming from citizens." This week's rejection of a presidential proposal was the latest in a longer series of political showdowns. Last month, PMR's Parliament refused to pass Igor Smirnov's bill on amending the law on customs rates. The President then proposed to levy a customs duty on the exports of building materials - cement, sand and gravel. Prior to that rejection, Members of Parliament also turned down Smirnov's wish for steeper taxes on locally produced vodka and beer. Some already-passed laws which were put in place by Smirnov's supporters before the opposition took control of Parliament have also been repealed. Among them, Parliament recently voted to cancel a migration tax on foreigners coming to or transiting the country, as well as a removal on taxes on imports from Moldova. Pridnestrovie (Transdniestria) is not by any stretch of the imagination a dictatorship, believes the EU's representative in the region, Kalman Mizsei.
" - Transdniester is not a closed dictatorship, it is structured society, there is a plurality of viewpoints and intentions," said the European Union official during an international conference in Romania in July. Earlier this year, an OSCE-funded report also reached the same conclusions, and many observers now say that the opposition in Pridnestrovie is clearly more active, vibrant and powerful than the opposition in neighboring Moldova. Whereas Moldova has a weak opposition, and the presidency is held by the dominant party in Parliament, it is the opposite in Pridnestrovie: There, Igor Smirnov faces increasing resistance from a Parliament which is led by the country's largest opposition party. The result is a plurality of opinions and a lively exchange of opinions. On basic questions, such as the survival of the state, both sides of the aisle agree: Even the country's far-left Communist Party agrees with the pro-business Renewal party that the only logical future for Pridnestrovie is independence. Igor Smirnov, in the middle between the two, also strongly supports continued independence, as does the vast majority of local voters.